Cornell lacrosse. Photo Credit: Tommy Gilligan, USMA. 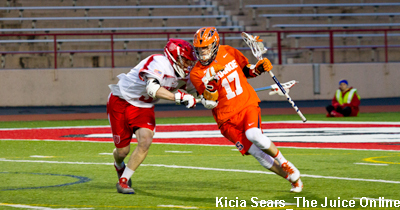 Tucker Dordevic scored the first goal of the game to give Syracuse an early lead, and the Orange would not trail until 11:47 in the fourth quarter when Clarke Petterson’s unassisted goal gave the Big Red a 9-8 advantage. But after after Brendan Bomberry tied the game less than three minutes later, Colton Rupp would score with 5:35 left on a man-up opportunity in what turned out to be the game-winning goal. It didn’t start that way for SU, who jumped out to a 7-4 lead after Nate Solomon’s goal midway through the second quarter. But Cornell stifled SU’s offense the rest of the way. Syracuse dominated at the X, winning 16 of 24, but struggled elsewhere. The Orange was outshot on goal 22-17, committed 15 turnovers and went scoreless on three man-up chances. Petterson scored five goals to lead Cornell, while three different Orange (Jamie Trimboli, Dordevic, Bomberry) each scored a pair of goals. 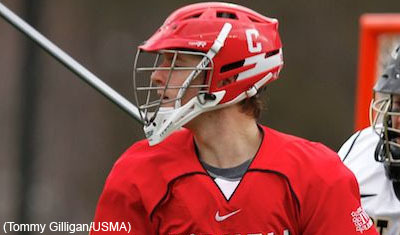 Cornell will play Maryland in Annapolis on Sunday in the quarterfinals.